The region simulator configuration is managed using a file called OpenSim.ini. This file is used regardless of whether the sim is running in standalone or grid mode. This file references some additional configuration information from the config-include/ directory. Information about the various settings is contained in the OpenSim.ini file itself (or OpenSim.ini.example for reference). Please note, that the name OpenSim.ini can be changed via command line arguments. It is also possible to distribute the inifile settings over two files. This is useful if you want to run several OpenSim processes where most of your settings are identical except for a few. The master file is read first, then the inifile is read. Settings given in the inifile overrule settings given in the master file. The master file has the same format and the same keywords as the inifile, so the same documentation applies. Opensim supports the following database-engines. Information about setting these up can be found in the OpenSim.ini.example file and the other various example files in bin/config-include. See Database Settings to know the detailed settings for each database. SQLite (default) - a lightweight database that comes bundled with OpenSim and can be used without requiring any extra configuration. It is mostly intended to get you up and running quickly, not for production use. It is significantly slower than MySQL. A few features here (such as attachment persistence) have not yet been fully implemented. MySQL 5.1 (fully supported) - This is the recommended database for any use beyond experimentation or small standalone applications. OpenSim 0.7.1: It supports MySQL 5.5 out of the box. Windows x64 systems: There is currently an unresolved bug_id=5294 found when running OpenSim with MySQL 5.5 on Windows x64 systems. Opensim 0.7.0.2: Some users have reported problems with MySQL 5.1.55 and up with Opensim 0.7.0.2, see this thread for more information. The issue can be resolved by using an updated version of MySql.Data.dll OR installing an older version of MySQL such as MySQL 5.1.52 with Opensim version 0.7.0.2. MSSQL (partially supported) - some recent OpenSim features may not yet be implemented. We recommend that you first get OpenSim running in standalone mode before you attempt to connect it to a grid or run your own grid. OpenSim will start up in standalone mode out-of-the-box on the binary distributions. 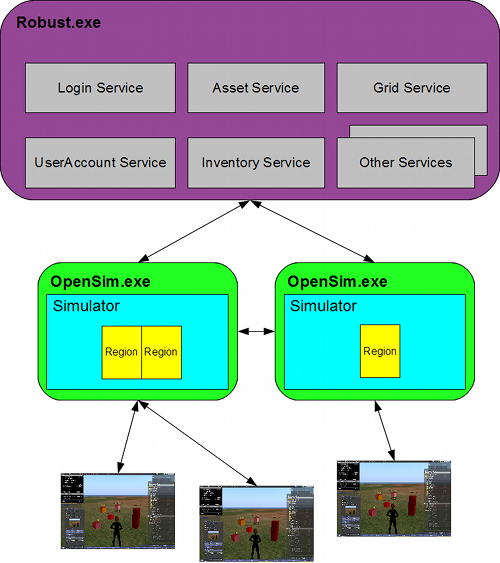 An OpenSim configuration consists of regions (run by region simulators) and backend data services (such as user, assets and inventory management). A system running in standalone mode runs both the region simulator and all the data services in a single process when you run OpenSim.exe. In this mode you can run as many regions as you like but only on a single machine. OpenSim running in standalone mode. 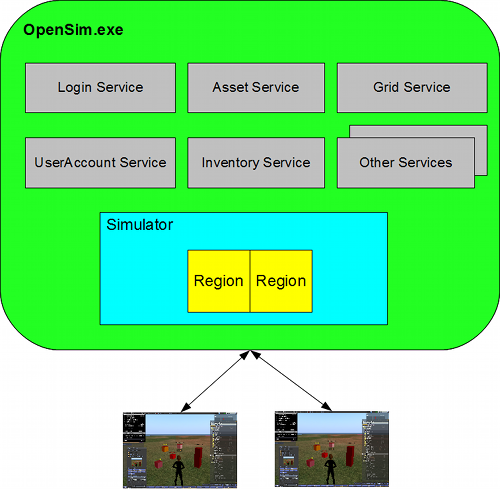 Both simulator and services run in the same process (OpenSim.exe). In grid mode, the data services are not part of the region server process. Instead, they are run in a separate executable called Robust.exe. A Robust shell can run all the services or they can be split amongst any number of Robust instances. This allows them to be run on entirely separate machines if necessary. In this mode, the OpenSim.exe acts solely as the region server, serving one or more regions that communicate with the separate data services. At this point you can run multiple OpenSim.exe region simulators on different machines. OpenSim running in grid mode. In this case, all the services are being run within a Robust.exe process. Multiple copies of OpenSim.exe (usually running on different machines) all use the same set of common services. Running in grid mode is more complicated than running in standalone mode. It requires an understanding of UUID, X,Y location, server handshake passwords, estates and estate owners, and a couple of other settings. These require more care and patience to set up. We strongly recommend that you don't attempt this unless you are extremely patient and very technically proficient. Binary distributions of OpenSim are by default configured to run in standalone mode. Copy the file OpenSim.ini.example to OpenSim.ini. This configures the 3D simulator itself. Copy the file StandaloneCommon.ini.example to StandaloneCommon.ini. This configures the in-process data services used by the standalone configuration. Running OpenSim is then a matter of launching OpenSim.exe. However, you need to have installed all dependencies before that. See Dependencies for details. After that, open a command prompt (for Windows users, Start menu > Run > cmd) and navigate to the Opensim /bin directory. This can be done under both 32 and 64 bit modes with the ODE physics engine. If you're running OpenSim for the first time, it will ask you several questions at the console that will set up a single region for you. The configuration options you enter will be written to the bin/Regions/Regions.ini file, which you can then edit at a later date if you need to make changes. The name for your region. Don't leave this blank! This is the location of the region on the grid. In standalone mode you can safely leave these as the default (1000,1000). If you were to set up additional regions later on in Regions.ini then they would need different grid co-ordinates (e.g. 1000,1001). OpenSim regions can be placed anywhere on a 65536 by 65536 grid, but Hypergrid enabled regions may need special consideration for region location. See Installing_and_Running_Hypergrid#The_4096_Regions_Limit for more information. In virtually all cases this can be left as 0.0.0.0 (this is a wildcard that allows OpenSim to listen for UDP connections on any of the server's network interfaces). If you want to restrict UDP connections to only one network interface then you can specify an explicit IP address. This address is only used internally - the External host name is the one that is actually passed to the viewer (and hence is the important one). This is the IP port for all incoming client connections. The name is a bit misleading since it will be used externally (by a Second Life viewer, for instance) as well as internally. You can make this any port you want, but it is safe to leave at the default 9000. Each region on your server must have a unique port. This is currently experimental. Please leave it at the default of False. If you leave this at the default 'SYSTEMIP' then this will become the LAN network address of the machine (e.g. 192.168.1.2). This is fine if you are connecting only from within your LAN. If you want to connect to it from a client on the internet, this should be the External IP Address of your router. Fully Qualified Domain Names (FQDNs) can also be used though they will be converted to a numeric IP address before being sent to the viewer. The following details are also asked in OpenSim 0.6.9 and earlier. This is a legacy OpenSim feature and can be left at the default of 00000000-0000-0000-0000-000000000000. Later on, you may want to change this to your own avatar's UUID in Regions.ini if you have problems editing terrain. This is an alternative way of specifying the master avatar by avatar name rather than UUID. If you press enter here then both this field and the last name field will be left blank. Accepting the blank default is fine - this can always be changed later in Regions.ini file. The last name of the master avatar. The password of the master avatar. In OpenSim 0.7 and later, OpenSim will ask you to assign each region to an estate during the setup process. If an estate needs to be created then it will also ask you to assign an estate manager. In standalone mode, an estate manager can also be created during the setup process. Don't forget the account details you use to set up the master avatar (in 0.6.9) or the estate manager (in 0.7 and later). Only this user will initially be able to configure the in-world settings for your region. This is also a user account that you can use to perform your initial login test. See Configuring Regions for more information about the Regions.ini file that these questions generate. This will ask you a series of questions for creating a user (such as first name, last name and password). Then enter the user name and password you set up in the previous step and your new user should login. Running OpenSim in grid mode is considerably more complicated than running a standalone instance. Instead of running everything in the same process, backend data services (asset, inventory, etc.) run in one or more separate processes, often on a different machine. This allows multiple OpenSim.exe simulator instances to use the same asset and inventory data. 1. In the bin directory, copy Robust.ini.example to Robust.ini. The example file is configured to run all the services in a single ROBUST instance. 2. Configure the [DatabaseService] section of Robust.ini to use your MySQL database. Only MySQL is supported for running grid services. If you don't see any errors (in red) on the console then you can move on to the next step. 4. Every region must belong to an estate, and every estate must have an owner which is a valid user account in OpenSim's user account service. Create a user on the ROBUST command console with the following command. This will ask you for the user's name, password and an optional e-mail. Remember this name since you will need it when you start up the simulator for the first time. In grid mode, as in standalone mode, you need to configure OpenSim.ini which controls the 3D simulator itself. However, instead of using and configuring the file config-include/StandaloneCommon.ini, a simulator connecting to a grid needs to use and configure the config-include/GridCommon.ini file, in order to connect to the ROBUST hosted remote data services rather than in-process local ones. The steps for both these operations are as follows. The others should remain commented. 3. Go to bin/config-include and copy GridCommon.ini.example to GridCommon.ini. 5. Run OpenSim.exe. If you're running OpenSim.exe for the first time you will get the same questions about setting up the region that occur on a first-run in standalone mode. Please see the standalone section for instructions on how to answer these, or read more information about the Regions.ini file on the Configuring Regions page. The loginuri needs to be the address to the login service. In standalone mode, this was the same address as the region simulator and the port was 9000 by default. However, in grid mode it will be the address to login service hosted on the ROBUST instance. In this case, the address will be 192.168.1.2. The port number of 8002 is the traditional one for the grid login service and is the default in Robust.ini.example. 7. If the login is successful, you will see log lines on the ROBUST console (for the login itself) and then log lines on the region simulator console (as the login process tells the simulator to expect the avatar, tells the viewer the address of the region simulator and then when the viewer starts talking to the simulator directly). To set up the region server (i.e., OpenSim.exe) to connect to an external grid, follow the Configuration#Step_2:_Configure_an_OpenSim.exe_to_use_the_ROBUST_services instructions above. The grid will have already provided with the required services. In step 2 you will need to use the provided URLs for their services. In your bin/Regions.ini file (or other region config file) you will also need to set the grid co-ordinates to your regions provided from the grid operator. See Configuring Regions for more information. Hypergrid is an emerging architecture supported by OpenSimulator that allows a user with an account on one standalone or grid to visit other Hypergrid-enabled standalones or grids, and for users from those grids to visit the home grid. This does not require the two installations to share a central set of data services (assets, inventory, etc.). Please see Installing and Running Hypergrid for more details. As of OpenSim 0.6.7, the default physics engine for OpenSim was changed to the ODE engine. This is because ODE is by far the most advanced physics engine plugin currently in OpenSim. Unfortunately, it has the drawback in that its library is not compilable under 64-bit in Windows. An alternative is to use the basicphysics engine instead or one of the other alternative physics engines bundled with OpenSim, though all these are far less functional than the ODE plugin. This only applies for Mono before 2.6. More recent versions of Mono have better thread handling. For more information, see ThreadPool_Deadlocks at the mono-project website. If you're using mono, you should increase the value of the mono environment variable MONO_THREADS_PER_CPU from its default of 5 to some number that works for your sim. The exact number depends on many factors including: the number of CPUs in your machine, what else you use that machine for, how many regions you have in your sim, how many of them are adjacent, how many scripts you have, and how many avatars you expect to serve at the same time. As a reference, Wright Plaza in OSGrid, which is running as a single region on a sim and routinely hosts meetings with 20 avatars, uses the value 125. If this number is too low, the operation of your sim will start to break in all sorts of different ways. A common symptom is the freezing of all activity upon login of a new avatar. Other symptoms are a lot more subtle. If you have problems using the OpenDynamicsEngine on *nix, try setting your stack reserve level higher than the default with the following command; ulimit -s 262144 Or, run the opensim-ode.sh to start up OpenSimulator. Some operation systems or distributions run their own firewall by default. If you can't access to OpenSimulator from remote client, you'll need to check their settings. See Firewall Settings for details. These are some pages containing some legacy configuration information of unknown accuracy. If you've looked through OpenSim.ini.example or any other of the config files, you'll see that there's a very large number of configurable parameters. See Configuring Simulator Parameters for more details. For each subsequent instance of OpenSim, change the 'http_listener_port' in OpenSim.ini to the value excluding 9000, and 'InternalPort' in Regions.ini to the value excluding 9000. Also, make sure your regions are using different ports, as explained in Configuring Regions. You can load content onto regions by using the load oar command. To load individual OAR files into each region, use the 'change region [regionname]' command and then 'load oar [oar-location]'. OpenSim.exe has command line options which allow you to perform actions such as reading configuration files from a different directory. See OpenSim.exe Command Line Options for more details. OpenSim supports multiple script engines. See ScriptEngines for details. If you don't know what this means then the default script engine will be fine. In fact, recent versions of OpenSim only ship with one script engine, the XEngine. OpenSim has a quite elaborate set of permissions. See Permissions (Server) for details. By default, permissions are active on region simulators. By default, OpenSim logs information to a file called OpenSim.log in the bin directory. See Logging for details on how to further configure this if required. OpenSim contains a web server that can serve up a variety of pages. Some which come from external files and some are generated internally. Upgrading to mySQL from SQLite. Server Commands for creating users and controlling the system.